Burrs are 42 mm in diameter and can be easily accessed for cleaning. You may find coffee grounds in the machine when you open it up from the box. 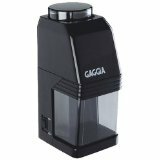 This is because Gaggia tests each and every unit before shipping. 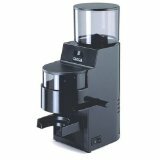 Simple grind control provides you with 9 grind settings for just about any type of coffee maker from siphon, French press, drip, espresso, and more. Grinding uses a simple to operate push button. The coffee container is removable for ease of emptying and cleaning.